Specialty: Developed and manufactured radios, televisions, hi-fidelity stereo receivers, home appliances, personal electronics, audio/video equipment, microchip & automotive components. Among the 50 largest companies of the World. 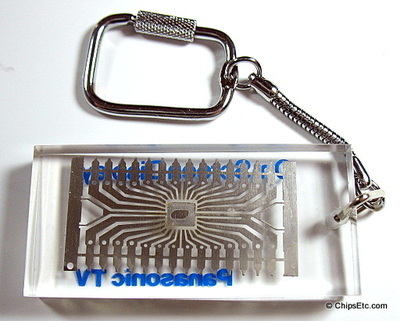 Matsushita consumer electronic brands have included JVC, Technics, Panasonic & Quasar. National was a brand used by Panasonic Corporation (formerly Matsushita Electric Industrial Co., Ltd.) to sell home appliances, personal appliances, and industrial appliances. It was arguably the first well-known brand of Japanese electronics. 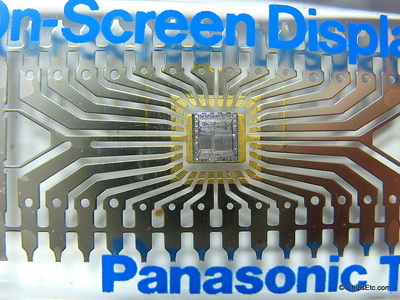 National was formerly the premier brand on most Matsushita products, including audio and video and was often combined as "National Panasonic" after the worldwide success of the Panasonic name. 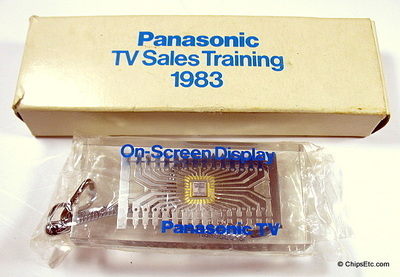 After 1980 in Europe, and after 1988 in Australia and New Zealand, Matsushita ceased the usage of "National", and sold audiovisual products exclusively under the Panasonic and Technics nameplates. 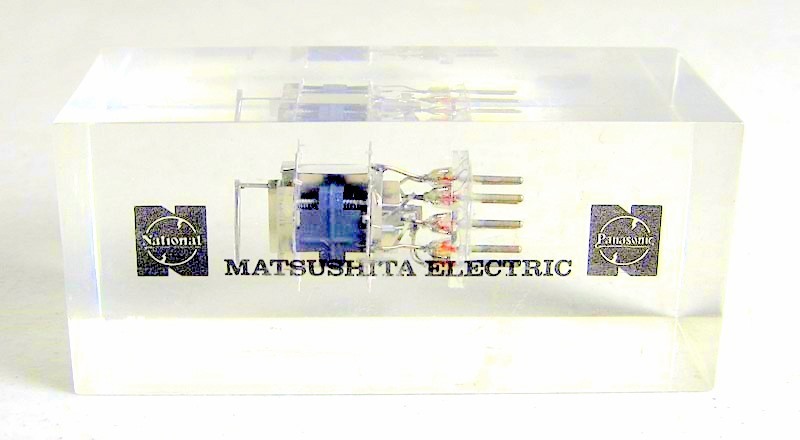 This Lucite paperweight contains an actual Matsushita Electric Pre-Amp vacuum tube assembly as shown before it would have had the vacuum tube glass blown around it. These were popular in audio equipment and Matsushita Pre-Amp tubes are still highly regarded for there low noise characteristics. The Quasar brand was first marketed by Motorola back in 1967. Quasar quickly became a leading brand name for transistorized color televisions. 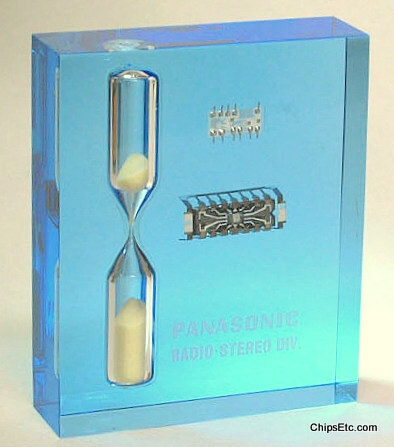 In 1974 Motorola sold its Radio / Television design & manufacturing facilities in the United States to Matsushita Electric who had already started their own successful global brand, Panasonic. The Japanese company was able to greatly improve the quality of their new Quasar branded televisions. They would go on to produce many consumer electronics including VCRs, camcorders, microwave ovens, and more under both the Panasonic and Quasar brands for another 30 years. 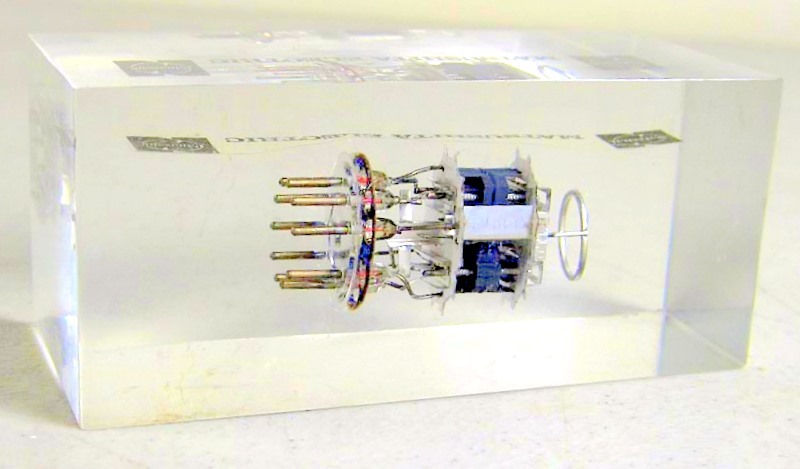 Starting in the late 1970's, Quasar Electronics, Inc. manufactured both televisions and microwave ovens at their plant in Franklin Park, Illinois. This Lucite paperweight from Quasar features a humidity sensor component used in their new Insta-Matic microwave ovens introduced in 1977. The Quasar Insta-Matic microwave ovens were the first to feature one button cooking control. Cooking with the Humidity Sensor Control eliminated the need to use a a timer or cooking probe. Measures 4 1/4” wide x 2” tall x 1 1/4” thick. 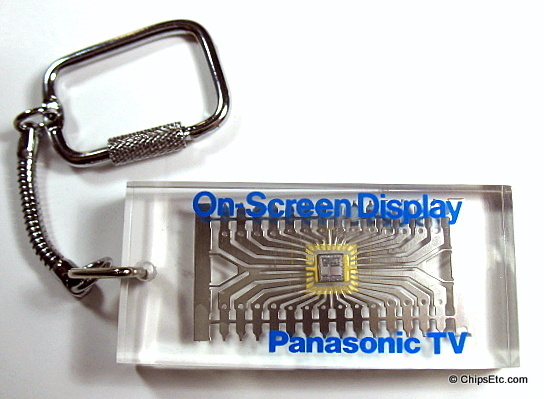 Lucite keychain from the Panasonic sales team introducing their new "On Screen Display" Integrated Circuit technology used in their new line of Digital Televisions. In 1983, TV manufacturers were starting to transition to digital receivers with computer chips that would replace hundred of components and process video in digital form. 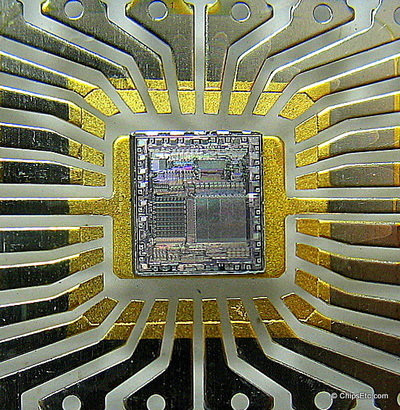 Computerized picture and sound circuits simplified TV alignment, noise and ghost reduction, teletext and video-text reception, and compensation for component aging, Integrated Circuits also made possible new features such as freeze frame, color picture within a picture, zoom, 1,000 line images, automatic VCR programming, and more. New, unused, in original packaging and box.